TV show dates: September 25, 2017 — present. Performers include: Iain Armitage, Zoe Perry, Lance Barber, Annie Potts, Montana Jordan, Raegan Revord, and Jim Parsons (voice). A Big Bang Theory prequel, created by Chuck Lorre and Steven Molaro, the Young Sheldon TV show unfolds in 1989 and centers on Sheldon Cooper (Armitage), when he was just a nine-year-old boy. Surviving childhood in an East Texas outpost — one dedicated to all things faith and football — will be no mean feat for this unique genius. While academically precocious, Sheldon is still a vulnerable child and perhaps even more innocent than his intellect and tender years might suggest. When he skips four grades to join his big brother George, Jr. (Jordan) as a high school freshman, the otherwise ordinary Cooper family must come to terms with the realities of having a genius in their midst. Georgie is keenly aware that attending class with his little brother is not going to help his coolness quotient. Establishing yourself in high school is hard enough, without doing so alongside your awkward, brilliant little brother, who is often candid to the point of tactlessness. Sheldon’s twin sister, Missy (Revord), expresses relief that she’ll no longer have to matriculate with her womb-mate. Still, she is not immune to pangs of jealousy brought on by all the attention lavished upon him. Nonetheless, he can count on her to tell him the truth. For her part, their mother Mary (Perry) wants to nurture her her bright, quirky boy. The trick is balancing that with helping him to fit in — or at least not stand out quite so obviously. While she doesn’t want to stunt her son’s potential, she dearly wants to protect him from those who fail to understand him and often don’t even try. George Cooper, Sr. (Barber) is a regular guy who works hard to do right by his wife and children. A football coach who moved his family to Medford, after he lost his job in Galveston for reporting rules violations, George just wants to be a find a way connect with and guide this boy he doesn’t understand. Finally, there’s Meemaw (Potts). Despite being a foul-mouthed, hard-drinking Texan, she appreciates her grandson’s spectacular gifts and only wants to support him. Along with his parents and siblings, Sheldon’s beloved grandmother is one of his influences, as he comes into his own. What do you think? 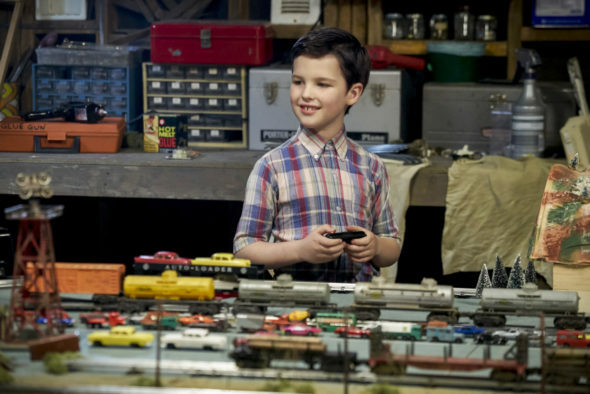 Do you like the Young Sheldon TV series? Should this TV show be cancelled or renewed for another season on CBS? It should be continued. Much better than Big Bang Theory. Good actors, good storylines. I love this show and the actors – especially Sheldon. Please do not cancel it ANYtime. I have friends from 10 – 75 that thoroughly “enjoy” the program and ALL the characters. Writers and cast have done an excellent job. Thank you. I think I just love this show. Great actors, Love MeeMaw, it’s getting better and better. Great comedy, Do not cancel! Keep it going for years, we love it.